A reviewer once wrote that his voice was like two elements flowing into each other: the elegance and the technical sovereignty of a ‘Tenore di grazia’ like Alfredo Kraus and the silver core and the ‘tears’ of a Fritz Wunderlich. 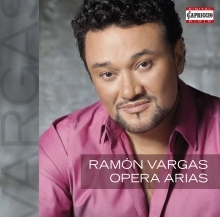 Having sung more than 40 roles, Ramón Vargas is recognized as one of the leading lyrical tenors of the present. His interpretations of Mozart, Bellini and Donizetti are celebrated throughout the world. In recent years, he has turned to the French repertoire with success: e.g. 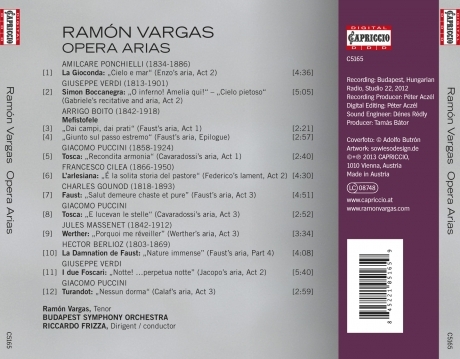 Werther, Manon, Romèo and La damnation de Faust. He has also devoted himself to Puccini and new Verdi operas such as La Bohème, Un Ballo in maschera, Simone Boccanegra, I due Foscari, La traviata, Rigoletto, Ernani etc. which some of them he presents the first time on CD on this new album!